Chapter Fifteen of Brahma Vaivarta Purana talks about Shri Radha-Krishna-vivaha (the wedding of Radha and Krishna). Once Nanda baba was carrying little Krishna on his shoulders for tending cows. It started raining heavily and Nanda baba was worried about Krishna and cows, he saw that one forest woman is coming out from the forest. Nanda baba called her and told her to hand over Krishna to mother Yashoda in Nandgaon and he will bring the cows. That forest woman was Shrimati Radharani. She took Krishna in her arms and went on the way to Nandgaon. On the way they both took form of Kishor and Kishori, and lord Brahma came on the scene and as brahman he got both of them married. After that Krishna again took the form of child and Radharani as forest woman and took Krishna to Nandgaon and handed over to mother Yashoda. Krishna also married to all gopis of Vrandavan when lord Brahma stole all cowherd boys and calves. Krishna expanded himself into all cowherd boys and calves. In that year mother Purnmasi (elderly gopi of Vrandavan) got all boys married to respective gopis. 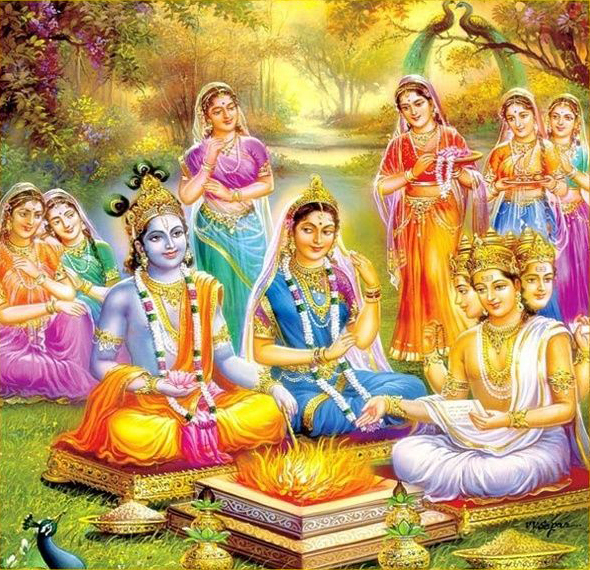 All gopis are wifes of Krishna. 1. Shri Narayana Rsi said: One day, taking infant Krishna with Him, Nanda tended the cows in a banyan grove of Vrndavana forest. 2. He drank the sweet water of a lake, made the cows drinks also, and, holding infant Krishna to his chest, he sat at the roots of a banyan tree. 3. O sage, then Lord Krishna, the Supreme Personality of Godhead who was playing the role of an infant, employed His Yogamaya potency to suddenly cover the sky with clouds. 4-5. Seeing the cloud-covered sky, darkened forest, howling winds, ferocious thunder, great rainstorm, wildly shaking trees, and falling branches, Nanda became afraid. 6. Nanda said: How can I go home now and leave the calves behind? If I do not go home, what will become of my boy? 7. As Nanda spoke these words, infant Krishna, pretending to be afraid, cried and clutched His father’s neck. 8-22. At that moment beautiful Radha, walking more gracefully than the khanjana birds and the rajahamsa swans, her beautiful face glorious as the autumn moon, her glistening eyes robbing the midday autumn lotuses of their beauty, Her beautiful eyelashes wonderfully splendid with black kajjala, Her beautiful nose crushing the beauty of the bird-king’s beak, Her nose decorated with a great and precious pearl, Her earrings robbing the midday summer sun of its splendour, Her lips robbing the ripe bimba fruits of their beauty, Her splendid teeth eclipsing rows of pearls, Her smile destroying the splendour of jasmine flowers just beginning to bloom, gracefully decorated with musk and sindura dots, Her beautiful cheeks graceful with curly locks of hair, the hairs of Her boy erect with joy, Her breast decorated with necklaces of the kings of jewels, Her firm breasts more graceful than a pair of shriphala fruits, beautiful with painted pictures and decorations, splendid with precious jewels, Her waist very graceful, Her deep navel marked with wonderful tri-bali lines, decorated with a belt of precious jewels, her knitted eyebrows Kamadeva’s weapons to bewilder the minds of the kings of the yogis, Her firm thighs graceful like elephant trunks, Her feet robbing the land-growing lotuses of their splendour, Her feet anointed with red lac and decorated with jewel pasakas, Her lac-anointed toenails robbing the regal jewels of their splendour, decorated with tinkling anklets of precious jewels, decorated with jewel bracelets and armlets, beautiful conchshell ornaments, and many finger rings, splendid with garments pure as fire, Her fair complexion robbing beautiful campaka flowers of their glory, and holding a splendid pastime-lotus and a jewel mirror to see the beauty of Her face, approached the infant Krishna. 23. Seeing Radha, illuminating the ten directions with a splendour greater than ten millions suns, suddenly come to that secluded place, Nanda was very surprised. 24. His head bowed and his eyes filled with tears, he said to Her: From Garga Muni’s mouth I have learned that to the Supreme Personality of Godhead You are more dear than Goddess Laksmi. 25. I also know that this boy is the infallible Supreme Personality of Godhead, beyond the modes of nature and superior even to Lord Maha-Vishnu. Still, I am just an ordinary human being, bewildered by Lord Vishnu’s illusory potency. 26. O beautiful one, now You may take my son and enjoy with Him as You like. When Your desires are all fulfilled, You will return Him to me. 27. After speaking these words, he fearfully gave the crying infant to Her. She accepted Him with a sweet and happy smile. 28. She said to Nanda: Take care that this secret is not revealed. How many births of pious deeds have made you able to see Me? 29. Garga Muni told you, and therefore you know the secret of why Krishna and I have come to Gokula and Vraja. 30. Please ask for whatever your heart desires. I can easily give to you what even the demigods cannot attain. 31. Hearing Radha’s words, Nanda said to Her: Please give me devotion to the feet of Lord Krishna and Yourself. I do not desire anything but that. 32. O supreme goddess, O mother of the universes, please grant the rare boon that Yasoda and I will always stay near You and Krishna. 33. Hearing Nanda’s words, Goddess Radha said to him: I will give to you devotional service that has no equal. 34. Day and night You and Yasoda will always remember Lord Krishna and Me in the blossoming flower of your hearts. This memory of Us is very difficult to attain. 35. I give you the blessing that the illusory potency will not cover You and Yasoda. At the end, leaving your human forms behind, you two will go to Goloka. 36. After speaking these words, She held infant Krishna to Her breast, to Her heart’s content embracing Him for a long time with both arms. 37. Holding Him to Her breast, embracing and kissing Him again and again, and hairs of Her body erect, She remembered the circle of the rasa dance. 43. ...splendid with seven stairways of jewels the colour of kunkuma, and also splendid with flower gardens frequented by swarms of bees. 45. ...a jewel pot of cool, clear, nectarean water, and, O Narada, many jewel pots filled with nectar and honey. 47. ...who, dressed in yellow garments, smiling, charming, and His face and eyes happy, was reclining on a flower couch,..
51. ...who was embraced by a jasmine garland, who wore a triple crown of peacock feathers, and who was looking at the jewel palace. 52. Noticing that there was no longer any infant on Her lap, Radha gazed at the youth before Her. Even though She remembered everything perfectly, She was still filled with wonder. 53. Gazing at this handsome form, Radha became bewildered with passionate love. The two cakora birds of Her eyes happily gazed at the moon of this person’s face. 54. Radha gazed at Him with unblinking eyes. The hairs of Her body stood up. She smiled. Tormented with amorous desires, She yearned to embrace Him. 55. As passionate Radha, Her lotus face smiling, gazed at Him, Lord Krishna spoke to Her. 56. Shri Krishna said: O Radha, You must remember what happened in Goloka. O beloved, now I will fulfil the promise I made to You. 57. O Radha, O girl with the beautiful face, I love You more than anyone. You are identical with Me. We are not different. 58. As whiteness is always present in milk, as heat is always present in fire, and as fragrance is always present in earth, so I am always present in You. 59-60. AS without clay a potter cannot make a pot and without gold a goldsmith cannot make a golden earrings, so without You I cannot create the world. You are the place where the world rests and I am the perfect seed from which it sprouts. 61. O saintly one, recline on this couch. Become the splendour decorating My chest. As an ornament is the body’s splendour, so You are My splendour. 62. When You do no stand by My side, the people call Me Krishna. When You do stand by My side the people call Me splendid Krishna (Shri Krishna). 63. You are splendour. You are opulence, You are the resting place of everything. For everyone, and also for Me, You are all power. 64. I am not an ordinary man and You are not an ordinary woman. That is the conclusion of the Vedas. O infallible one, You have the power to assume any form You wish, and I have that power also. 65. When I choose to appear as the Brahman effulgence, You also appear as the Brahman effulgence. When I choose not a manifest a form, You also do not manifest a form. 66. O beautiful one, when I choose to become the seed that begets everything, then by Your mystic powers You become the most beautiful of all women. 67. You are half of My body. You are the Supreme Goddess, the root of all nature. In power, intelligence, knowledge, and glory, You are My equal. 68. One who thinks We are different is the lowest of men. He stays in the hell called Kalasutra for as long as the sun and moon shine in the sky. 69. He makes seven generations of ancestors and seven generations of descendants fall down. The piety he earned in ten million births is destroyed. 70. They who foolishly insult Us are the lowest of men. They burn in hell through the lifetimes of a hundred Brahmas. 71. When one, suddenly frightened, calls out, “Ra!” I give him transcendental devotional service. When one adds the syllable “dha”, I, eager to hear his chanting, visit him. 72-3. O Radha, they who present to Me the sixteen offerings and devotedly serve Me during their entire lifetime are very dear to Me, but one who chants the name “Radha” is even more dear. 74-5. Brahma, Sesa, Siva, Yama, Nara-Narayana Rsi, Kapila, Ganesa, and Karttikeya are not as dear. Laksmi, Sarasvati, Durga, Savitri, Prakrti, and all the goddesses are not as dear. 76. To Me they are as dear as life, but You are more dear than life. They stay in different place, but You stay on My chest. 77. In My four-armed form of Narayana I hold Goddess Laksmi to My chest. In My original form of Krishna, I hold You to My chest always. 78. After speaking these words, Lord Krishna reclined on the beautiful couch. Her head humbly bowed, Radha spoke to Her Lord. 79. Shri Radha said: I know this. I remember everything. Lord, how could I forget? By the mercy of Your lotus feet I am all that You have said of Me. 80. O master of illusion, why do you put devotees like Me into illusion? Many devotees like Me are bewildered by Your maya potency. 81. By one devotee’s curse I have become a gopi on the earth, and You and I will be separated for a hundred years. 82. Why are some dear to the Supreme Lord and some not dear to Him? As they render service to Him, He grants His mercy to them accordingly. 83. You have the power to transform blade of grass into a mountain and a mountain into a blade of grass. Therefore You are equally kind to the competent and the incompetent, to the husband and to the wife. 84. O Lord, You are reclining on this couch and I am standing before You. This moment of Our conversation is like a hundred yugas. I cannot measure the time We have now spent together. 85. Please place Your lotus feet on My head and breast. Please extinguish the fire of separation that burns in My heart. 86. My glance at once fell on Your lotus feet. Only with a great effort am I able to pull My eyes from Your lotus feet and gaze at the rest of Your transcendental form. 87. Gazing, one by one, on each limb, My eyes finally rest on Your lotus face. I have no power to pull them to any other place. 88. Hearing Radha’s words, Lord Krishna smiled and spoke to Her the truthful and auspicious philosophy of the Sruti and smrti sastras. 89. Shri Krishna said: Beloved, for whatever happens to anyone in any place or any lifetime there is nothing to lament. I have already explained this to You. 90. O beautiful one, please wait for a moment. When the proper time comes I will fulfil Your desire and make You happy. 91. O Radha, I will not erase what fate has written. How can the demigod Brahma erase it? 92. I am the father of Brahma. What fate has written for Brahma and the demigods and for the lesser creatures also, is not to be broken. 93. At that moment, carrying a garland and a kamandalu in his hands and his four faces gently smiling, the demigod Brahma came before Lord Krishna. 94. His head humbly bowed, the hairs of his body erect, and tears in his eyes, Brahma bowed down before Lord Krishna and praised Him in many prayers. 95. Offering prayers and bowing down, Brahma approached Shri Krishna. Again bowing down with devotion, he then approached Shri Radha. 96-7. He bowed his head before the lotus feet of Shri Radha, the mother of all. With great respect he washed Her feet with water from his kamandalu and then dried them with the towel of his hair. Then folding his hands, he spoke many prayers. 98. Shri Brahma said: O mother, by Lord Krishna’s mercy I can now see Your lotus feet, which are rarely seen by the people of the earth and other places. 99. In ancient times I performed austerities for sixty thousand years in Puskara-tirtha on the earth. 100. After that Lord Krishna, the giver of boons, came to offer a boon. “Ask for a boon”, He said, and I happily asked for what I long desired. 102. “In time I will show them to you. For now, My child, please wait”, Lord Krishna said and left. 103. O mother of all, the words of the Supreme Personality of Godhead never go in vain. Because of His boon I am now able to see Your lotus feet, which everyone in Goloka and on the earth yearns to see. 104. The demigoddesses in the celestial planets are born into the material world. But You are born from half of Lord Krishna’s transcendental boy. You are His equal in all respects. 105. “This is Shri Krishna, and this is, You, Radha. This is You, Radha and this is Shri Krishna Himself.” Neither the Vedas nor I can say this of You two. We cannot distinguish between You and say that one is different than the other. Who can say it? 106. O mother, above the material world is the spiritual world of Vaikuntha and Goloka. O mother, as the spiritual world is eternal, so You are also eternal. 107. As the living beings in all material universes are part and parcel of Lord Krishna, so You are the powers and abilities that reside within all living beings. 108. All males are part and parcel of Lord Krishna and all females are part and parcel of You. Lord Krishna is the Supersoul present in the bodies of all conditioned souls. You are the resting place of Him. 109. O supreme mother, Lord Krishna’s breath created You, and You breath created Him, the Supreme Personality of Godhead. Of You two, who is the creator and who the created? 110. O supreme mother, as Lord Krishna is eternal, so are You. Is He the part and parcel of You, or are You the part and parcel of Him? Who can say? 111. I am the creator of the material universe and the father of the Vedas. By learning the Vedas from the guru’s mouth one becomes wise. 112. Still, I do not have the power to praise even a hundredth part of Your virtues and glories. What Vedic scripture or what great philosopher has the power to praise You? 113. Intelligence is the father of prayers, and You, O mother, are the mother of intelligence. Who has the power to praise You? 114. What everyone has seen a philosopher can describe. What philosopher can describe something no one has seen or heard of before? 115. Neither I, Lord Siva, Lord Sesa, Goddess Sarasvati, nor all the Vedas have the power to praise You. O goddess, we do not have to power to praise You properly. 116. I have described Your glories as far as I am able. Please do not criticise me. They who are supremely powerful are equally kind to both the wise and the foolish. 117. A child may be virtuous one moment and mischievous the next, but the mother and father, out of love, forgive any mischief he may do. 118. After speaking these words Brahma, the creator of the universe, bowed down before Shri Shri Radha-Krishna’s lotus feet, before which all the devotees yearn to bow. Then Brahma respectfully stood before the divine couple. 119. One who morning, noon and night recites these prayers spoken by the demigod Brahma attains devotional service to the feet of Shri Shri Radha-Krishna. 120. Pulling up all past karma by its roots, defeating invincible death, and jumping over all other worlds, He goes to the supreme abode of Goloka. 123. When Brahma said this, Radha at once replied, “So be it”. Then Brahma, the ruler of a material universe, devotedly bowed again before Her. 124. Then, sitting between Them both, Brahma ignited a sacred fire and, meditating on Lord Krishna, properly offered oblations. 125. Then Lord Krishna rose from His couch, sat by the fire, and, as Brahma recited the mantras, properly offered oblations. 126. Then Brahma, the father of the Vedas, bowed down before Shri Shri Radha-Krishna. Then he had Radha circumambulate Lord Krishna seven times. 127. Then he had Radha circumambulate the sacred fire. Then he bowed down before Lord Krishna. Then he offered a sitting place to Shri Radha. 128. Then he had Lord Krishna take Radha’s hand and then he had Lord Krishna recite seven Vedic mantras. 129. Then grandfather Brahma, the knower of the Vedas, placed Radha’s hand on Lord Krishna’s chest, and Lord Krishna’s hand on Radha’s back. Then he had Radha recite the mantras. 130. Then Brahma had Radha happily place a knee-length parijata garland around Lord Krishna’s neck. 131. Then Brahma had Radha bow before Lord Krishna and then he had Lord Krishna place a beautiful garland around Radha’s neck. 132. Then Brahma had Lord Krishna sit down and then he had smiling Radha, Her thoughts fixed on Lord Krishna, sit at Lord Krishna’s left. 133. O Narada, then Brahma had Radha and Krishna fold Their hands and recite five Vedic mantras. 134. Then Brahma had Radha again bow down before Lord Krishna. Then, as if he were the father and She were his daughter, Brahma gave Radha to Lord Krishna. Then Brahma respectfully stood before Lord Krishna. 135. Then the demigods, the hairs of their bodies erect with joy, sounded many dundubhis, anakas, murajuras, and other kinds of drums. 136. The demigods showered parijata flowers, the gandharvas sand, and the apsaras danced. 140. O sage, hearing the Supreme Personality of Godhead’s words, Brahma bowed down before Shri Radha and Krishna and then happily went to his own abode. 141. After Brahma’s departure, smiling Goddess Radha gazed again and again with crooked eyes at Lord Krishna’s face. Then She shyly covered Her own face. 142. Wounded by Kamadeva’s arrows and the hairs of Her boy now erect, She bowed before Lord Krishna and affectionately approached His couch. 143. Then She anointed Lord Krishna’s forehead and chest with tilaka markings of sandal, aguru, musk, and kunkuma. 144. Then She affectionately offered Lord Krishna a beautiful jewel cup of nectar and honey. Lord Krishna, the master of the universes, drank it. 145. Then Radha respectfully offered Lord Krishna delicious betelnuts scented with camphor and spices. Lord Krishna chewed them. 146. As Lord Krishna watched, Smiling Radha drank the nectar Lord Krishna offered Her and chewed the betelnuts He offered Her. 147. Lord Krishna happily offered Her the betelnuts He had chewed. She chewed them with great respect. She drank the nectar of His lotus face. 149. Then Lord Krishna anointed all of Radha’s limbs with sandal, aguru, and kunkuma. 150. Kamadeva eternally meditates on Lord Krishna’s lotus feet. Still, to please Shri Radha, Lord Krishna voluntarily placed Himself under Kamadeva’s control. 151. O sage, the servants of Lord Krishna’s servants defeat Kamadeva at every moment. Still, Lord Krishna, who is the supremely independent Personality of Godhead whose desires are always fulfilled, happily accepted defeat at Kamadeva’s hands. 152. Then Lord Krishna took Radha’s hand, placed Her on His chest, loosened Her garments, and kissed Her in four ways. 153. In Their amorous battle Her tinkling ornaments, the red ointment on Her lips, and the pictures and designs drawn with perfumes on Her limbs were all broken. 154. O sage, as They enjoyed amorous pastimes Her sindura tilaka and marks of red lac were all wiped away. 155. Filled with pleasure, and the hairs of Her body erect, Radha did not know whether it was day or night. 156. Pressing Her limbs against His, Lord Krishna, the most learned scholar of the Kama-sastra, enjoyed eight kinds of amorous pastimes with Radha. 157. Pulling smiling, crooked-eyed Radha to Him, Lord Krishna scratched and bit all Her limbs. 158. As They enjoyed amorous pastimes there was a beautiful sound from the tinkling of Radha’s bracelets, anklets, and tinkling ornaments. 159. In a secluded place Lord Krishna, the most learned scholar of the Kama-sastra, untied Radha’s braids and removed Her ornaments and garments. 160. Then Radha untied Krishna’s hair and removed His ornaments and garments. They were both expert in these pastimes. Neither was unhappy at this. 161. Then Lord Krishna forcibly took a jewel mirror from Radha’s hand. Radha responded by forcibly taking the flute from Krishna’s hand. 162. Lord Krishna sweetly stole Radha’s heart and mind, and Radha sweetly stole Lord Krishna’s heart and mind. 163. O great sage, when the amorous battle ended, smiling, crooked-eyed Radha lovingly returned the flute to Lord Krishna. 164. Then Lord Krishna returned Her mirror, gave Her a splendid pastime-lotus, made Her braids again beautiful, and marked Her again with sindura tilaka. 165. Lord Krishna dressed Her and decorated Her with ornaments and with wonderful and colourful pictures and designs drawn in perfume. Neither Visvakarma, nor even Radha’s gopi friends know how to make such graceful and beautiful decorations. How can they be described here? 166. As Radha was about to dress and decorate Him, Lord Krishna suddenly abandoned His form of Her youthful lover and suddenly became an infant again. 167-8. Seeing that the infallible Supreme Personality of Godhead had again become the crying, frightened, hungry infant that Nanda gave Her, Radha sighed. Her heart was shaken. Overcome with the grief of separation, She looked for Her lover here and there. 171-2. O Radha, why do You weep? Remember Krishna’s lotus feet. Until the time of pastimes in the rasa-dance circle, every evening You will leave a shadow of Your form at home and You will come here and enjoy amorous pastimes with Lord Krishna to Your heart’s content. Please don’t weep. 173. O beautiful one, please place on Your lap the infant that I the master of all illusions and the Lord of Your life, abandon Your lamenting and go home. 174-5. O Narada, hearing these words, Goddess Radha placed the infant Krishna on Her lap. She gazed at the jewel palace, the flower garden, and the forest, and then She suddenly left Vrndavana forest and, travelling as fast as the mind, arrived in half an eyeblink at Nanda’s palace. 177. I had to endure many difficulties on the path as I tried to carry this very big, hungry, crying, child Your husband gave to Me in the cow-pasture. 178. O Yasoda, the sky was filled with clouds, it rained again and again, and the path was muddy and almost impassable. My clothes were ruined. It was very difficult to carry your child. 179. O saintly Yasoda, please take your boy, give Him your breast, and make Him happy. I have been gone from home a long time. I must return at once. 180. Speaking these words, and giving her the infant Krishna, Radha went home. Saintly Yasoda took her infant, kissed him, and gave Him her breast. 181. From that time on, every evening Radha would leave Her household duties at home, go to that place in Vrndavana forest, and enjoy amorous pastimes with Lord Krishna. 182. O child, in this way I have told you something of Lord Krishna’s beautiful, sacred, peerless, delightful pastimes, which bring to the hearer liberation from the world of birth and death.